WTE designs, manufactures and supplies all types of sewage treatment plant and equipment. These include NON-ELECTRIC wastewater systems, cesspools, septic tank conversion units and pumping stations for both domestic and commercial applications throughout the UK, Ireland and worldwide. WTE manufactures the only Adjustable sewage treatment systems. Sewage Treatment PRODUCTS - Click on the Text Links below. No longer manufactured as a Standard product, as they are not allowed in most areas of the UK. 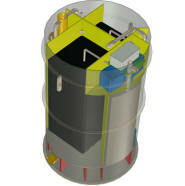 However, we can manufacture these low-profile septic tanks as bespoke tanks. Wastewater Treatment Options - Septic tank, sewage treatment plant or cesspool? Septic Tank and Soakaway Problems - Failed soakaways, blocked drain fields, leaking tanks. Sewage Surveys - For problems, pre-purchase reports, suitability and sewage treatment options. On-site surveys arranged. Installation, Repairs and Servicing - For all makes of sewage treatment plants. Environment Agency Requirements - Current rules and regulations in the UK and Ireland explained. Wastewater Legislation - All the rules about sewage and wastewater discharges in the UK and Ireland. Please click on our SITEMAP for details of all the 130 information-packed pages on this website. We are experts in sewage, supplying and arranging installation of sustainable sewage treatment solutions to prevent septic tank pollution of our environment and groundwater. We design and manufacture VORTEX® wastewater systems. 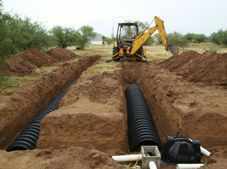 These are very cost-effective septic tank replacements or septic tank conversions, cheaper to install and run than septic tanks. INDEPENDENT advice on all aspects of domestic and commercial sewerage and drainage. 25 years in the wastewater industry. All makes of package treatment plant and septic tanks designed, supplied and installed. Free insurance claim drainage and tank reports arranged throughout the UK. Installation, repairs and servicing can be arranged anywhere in the UK. We design and supply sewage plant systems up to any size, for any site, even pre assembled treatment units in containers for the Middle East and Africa. Our treatment plants are Trademarked by WTE Ltd. Telephone WTE Ltd. on 01759 369915. We pride ourselves on great customer service - we have 30 years of experience on domestic house and commercial sites and are open Monday to Friday, 8am. till 5.00pm, for all your package domestic and commercial sewage treatment plant and septic tank enquiries.